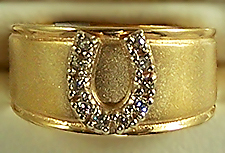 Ladies horseshoe diamond ring. Great gift ideas for the horse lover. The Gorgeous Horse is your source for handcrafted horseshoe jewelry. Here we have a diamond horseshoe placed on top of a nice cigar band. This design offers a mat finish with high polished shoe and borders giving it a very nice sophisticated look. Dimensions:10mm wide on top of ring. Shank tapers down to 5mm wide at the bottom. Horse shoe is set with .18ct of matching diamonds. Try this ring in two toned or all white 14kt gold. Size request located just below.